Not only do fans get to see more American Flat Track racing action, but up-and-coming AFT Singles riders get to practice racing twin-cylinder bikes in the AFT Production Twins class in preparation for moving up the the AFT Twins class without having all the class’ big dawgs breathing down their necks. 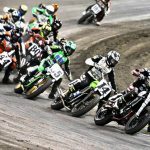 DAYTONA BEACH, Fla. (August 15, 2018) – The AFT’s Production Twins class, introduced at the Springfield Mile I in May and happening again at the Harley-Davidson Springfield Mile II on September 2, is all about opportunity. 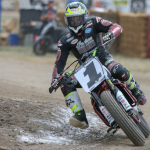 Opportunity for up-and-coming AFT Singles riders looking for seat time and valuable experience on faster, more powerful AFT Twins motorcycles as they consider their future as full-time AFT Twins competitors. And secondarily, opportunity for AFT Singles-licensed riders that may have ridden AFT Twins in past years but hadn’t scored championship points. 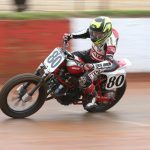 The Production Twins class is a positive for competitors and flat track fans. 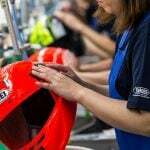 For competitors it offers that valuable seat time that helps bridge the gap between professional AFT Singles competition and the crucible of the intense AFT Twins class. For fans, the AFT Production Twins class will double the day’s racing action, adding excitement and drama to what’s already a top-shelf racing event at one of the most legendary venues in the country. The Production Twins riders getting introduced to the Springfield fans back in May. 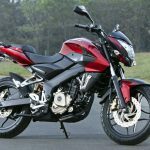 The class is designed around production-based, twin-cylinder machines with a displacement between 649-850cc. Eligible machines include BMW, Ducati, Harley-Davidson, Honda, Kawasaki, Suzuki and Yamaha twin-cylinder street bike engines. Race-only engines from machines such as the Harley-Davidson XR750 and XG750 Revolution X, Honda RS750 and Indian Scout FTR750 are not allowed in AFT Production Twins. Close racing in Production Twins kept fans interested, especially with Inderbitzin’s (54) run to the front. 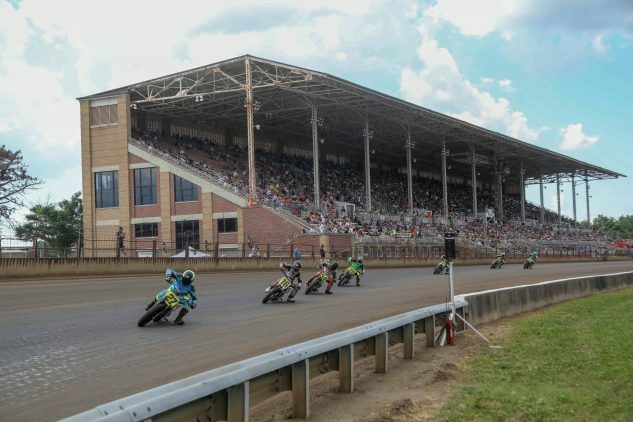 AFT Production Twins riders will vie for $7850 in purse money at the Harley-Davidson Springfield Mile event on September 2. Flag-to-flag coverage of every AFT Production Twins session will be live streamed on FansChoice.tv and highlights will be included in NBCSN’s coverage of the events. So… opportunity is knocking for a good-sized chunk of the American Flat Track paddock. 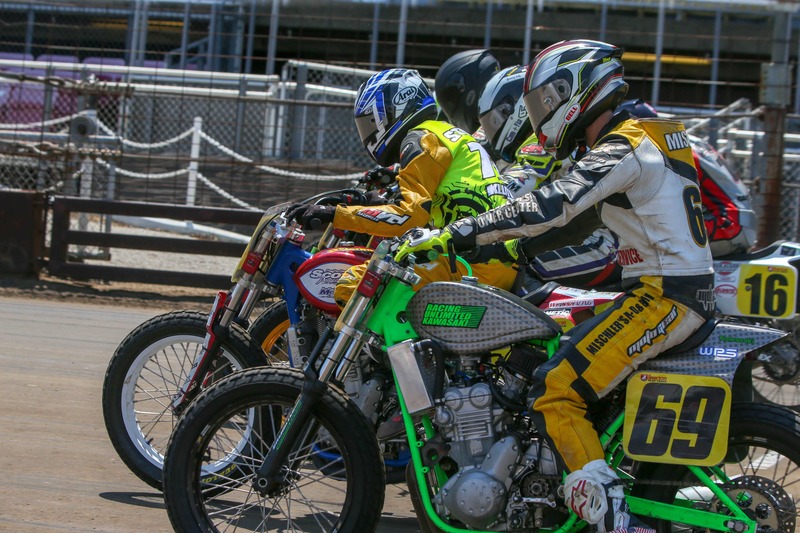 Here’s hoping a handful of teams and riders will see the benefits of the Production Twins experience and register for the Springfield Mile II on September 2. 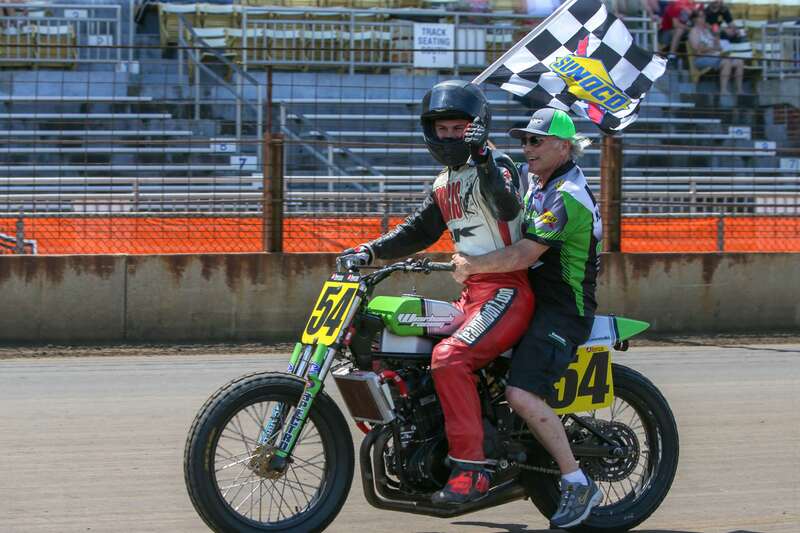 If Inderbitzin’s come-from-behind excitement in the May Springfield Mile is any indication, round number two is likely to offer plenty of high-speed, Springfield draft-’n-pass action. 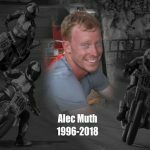 And that’s good news for fans and riders alike. Fans who’d like to experience the 100th running of the spectacle that is the Springfield Mile are encouraged to visit Springfield Tix to secure their seats. 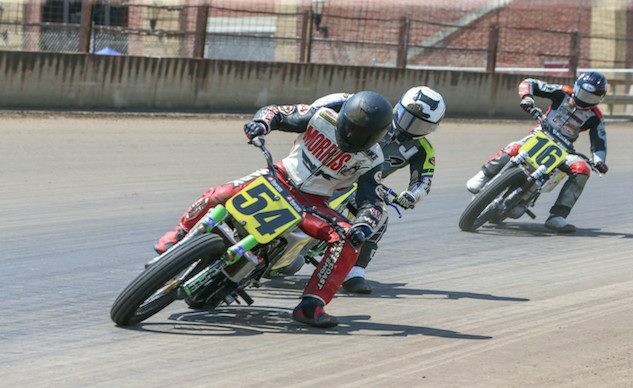 With the AFT Springfield Short Track happening on Saturday and the Springfield Mile taking center stage on Sunday, it’s a weekend of racing you do not want to miss. See you in Springfield in September! Morgen Mischler (69) got a slow start and ended up 7th after a mechanical derailed his Springfield Production Twins run. After a dead-last start, Inderbitzin (54) ran everyone down, though Tristan Avery (16) kept him honest at the end. Ahhh, yes, the thrill of victory! 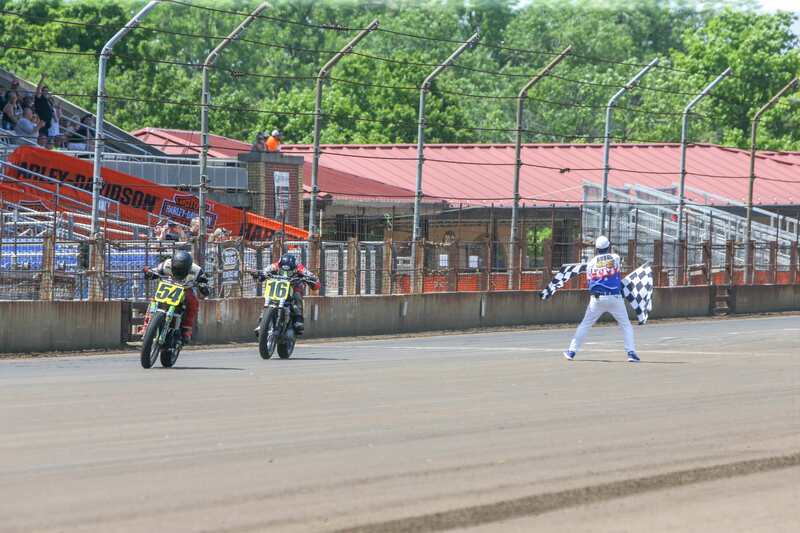 Michael Inderbitzin celebrates his dramatic win at Springfield in May.